This happy mugshot shows Jeanette Holt, 25, after her arrest. If the criminal allegation against her is the truth, she is truly a piece of work. 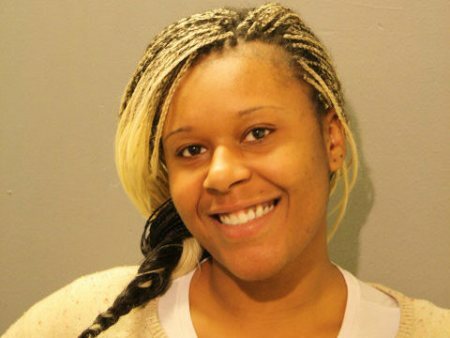 Chicago police accuse Holt of lying to police that her baby was taken when her car was stolen on Chicago’s South Side. Police launched a major hunt for the baby only to find out later that Hold allegedly lied because she wanted her car found. Holt called 911 to report her 1997 Chevy Monte Carlo had been stolen with her 1-year-old son strapped inside the car. Seven police cruisers were dispatched to comb the area for the car and the toddler. Police say that they later learned the boy was in childcare. She had left the car idling while she signed in the boy in daycare. Someone jumped in the car and drove it away. Holt has been charged with one count of felony disorderly conduct as opposed to filing a false police report. Of course, with Chicago police saying that they will no longer send officers immediately to investigate burglaries and other crimes, they may find more citizens lying about intruders being in their homes to receive basic police protections. This is how a car theft investigation is properly viewed by the fuzz. Has the car been recovered? Or is she now in Purgatory at the bottom of the hot-sheet? it was a 97 monte carlo. if she had shut it off it most likely wouldn’t restart. she should’ve told them there was two lbs of weed and a dozen krispy kream donuts in the car. Why disorderly conduct rather than filing a false report? The charge should match the behavior. How is this disorderly conduct? The judge should give her a copy of the story “The Boy Who Cried Wolf” and let her know her name is Boy. Left the car idling on the street? She should have been arrested for being too stupid to own a car. If she told Chicago Police there was 1k cash in the stolen car the entire force would have been on it. Geese fly…. What else is new…. While what she did was ultimately stupid given the possible consequences. What is a citizen to do in cases like this where a crime has been committed against them and the police are “too busy” to follow up? Can’t say that what she did is okay, but as JT notes, when cops don’t do their job by taking things like burglary (or auto theft?) seriously, then people are going to do what it takes to get results. So she basically found a way to get the cops to find something they wouldn’t’ve cared about otherwise? Why is auto theft like Gitmo torture? Because complaining about it in a way that can get results will get you arrested. I’m betting that that smile won’t last long. Since when did mugs shot become smiling poses or FB photos? A commentator on this site once said “that there is no cure for stupid.” I believe that would apply to one Jeanette Holt. Sometimes calls to 911 are made and the caller falsely claims shots fired. The purpose of this is it gets a quick police response. Such is life in the city.